Luckily I’m not superstitious, because nothing before the race went as planned. The night before I forgot about packet pickup, and had to turn around and leave the house right after getting home from work. Between traffic and my wife wanting to run some other errands, I didn’t get in my planned shake-out run on Friday (only my second non-running day in several months). Then, the next morning also started off on a sour note, as I had neglected to actually set my alarm to go off (it was set for only M-F). And yes, I was immediately reminded of the classic Seinfeld episode regarding the same subject matter. Fortunately, I had done the majority of packing and preparation the night before and was only slightly rushed in drinking a cup of coffee and a peanut butter and banana smoothie. We left the house with the sun still not quite peeking out over the Sandias, but by the time we exited I-40 and headed into Tijeras, the sun was up. The weather looked perfect for a long morning’s worth of running, with highs in the upper sixties and overcast skies forecasted. It was warm enough at the 7 AM start that I started in shorts, a tech t-shirt and arm sleeves, which I pulled down after just an hour or so into the race. Like most ultra/trail races the start was very low-key, with all the runners bunched up around some picnic tables behind the small registration tent. One of the participants sang a very gruff, but strangely fitting rendition of the national anthem and then we were off along the trail. In January, after I decided to sign up for the race, I drove out with the intention of checking out some of the course. Per usual for me, I didn’t put too much effort into bringing a detailed map or course directions. So I went to where I thought the first aid station was and ran on what I thought was part of the course. I kind of hated it. The forest service road was destroyed by tire tracks and was very muddy. I had a miserable run and was debating cancelling my registration. Turns out, I saw very little of the actual course. Also, the condition of the small portion that I had actually run on was vastly improved. The course was almost all single-track, with a good mix of barely-there dirt trails and rocky, technical mountain bike trails through endless pinon trees. 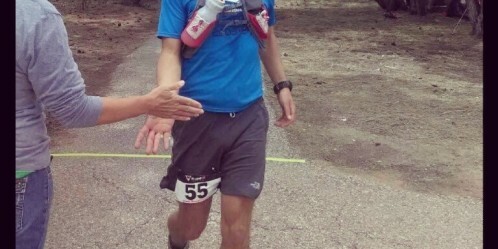 With roughly 4,000′ of climbing for the 45k, it was a near perfect mix of runnable and challenging. The out and back course had only a few significant climbs, with the actual Cedro Peak summit being somewhat a anticlimactic climb before descending to the turn-around checkpoint. Everything went mostly according to my plan during the race. 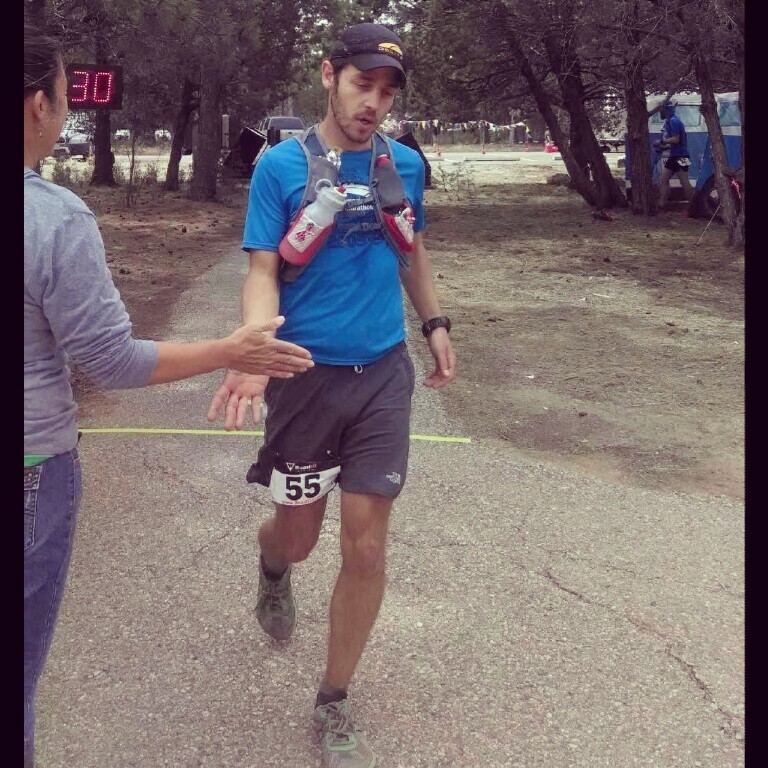 I finished a water bottle between each aid station and stayed on top of calories early and often. My legs and energy levels were great up until about mile 21. I had been taking electrolyte tablets every half hour and nipping on a homemade date gel mixture all morning. I had added a significant amount of sea salt to the gel, and my stomach ended up shutting down for an hour or so while I waited for the imbalance to correct itself. Multiple cups of water at the last aid station did the trick, and I was able to shuffle to the finish line at a slightly improved pace. When the results posted, my official time was 5:39, a few minutes slower than my watch registered for some reason. Had the race been an actual 50k, I’m sure I could’ve set a PR time. So, all things considered, I was pretty happy with my performance for an early season race. I still didn’t get the feeling that I could necessarily “race” the distance. Whether it was stomach problems, endurance issues or just a mental block after reaching 22+ miles, I definitely struggled the last two hours. I would really like to one day feel like I actually raced the 50k distance instead of just clinging on to reach the finish line. But, to be fair, this basically amounts to nit-picking what was otherwise an enjoyable and confidence-building day on trails practically in my backyard.